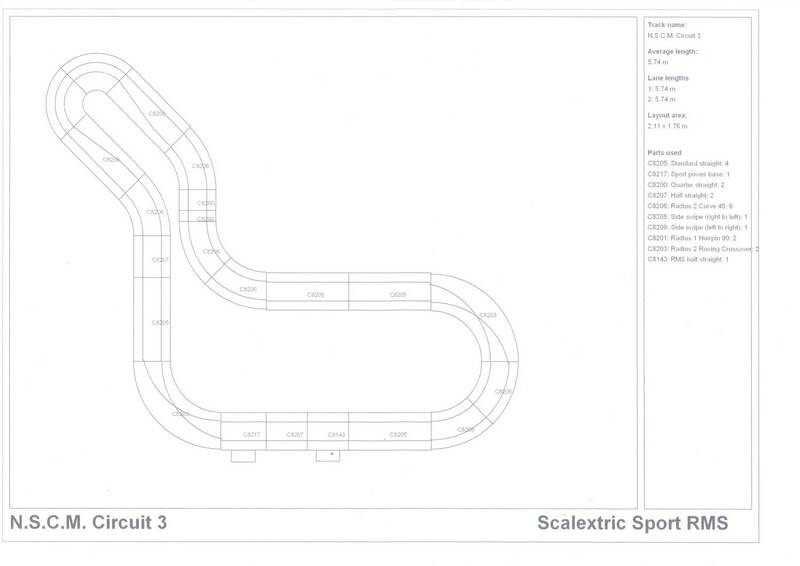 Scalextric circuit 1 You cant get anymore basic than this oval. Scalextric circuit 2 Again this circuit is based on the oval but this time with a bridge. Again a very simple and un-technical layout. Scalextric circuit 3 There third track is very similar, again a figure of 8 which is an easy shape to makes both lanes equally difficult. 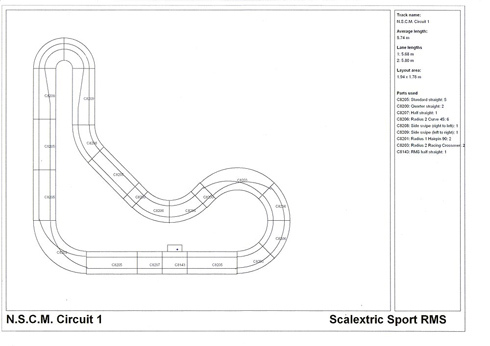 Scalextric circuit 4 It took Scalextric to circuit 4 to make a technically difficult track. At first glance the track does not seem to be even balanced but with the addition of extra runoff which comes in the add-on packs it means that the car on the outside is no longer being disadvantaged. 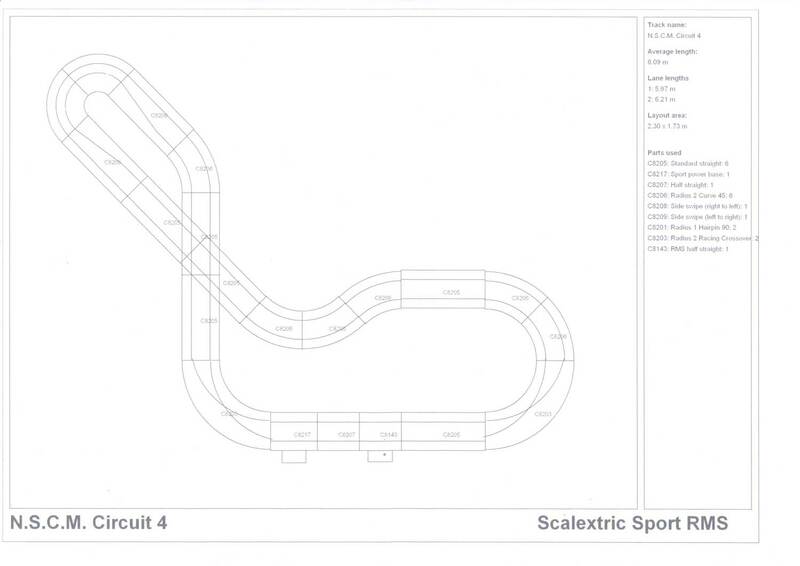 These circuits are not based around the Scalextric pack system rather from purchasing individual pieces: Simply download the files to a place you can remember and then find that folder when in RMS. Click on the file and select open. Now your ready to race it after you've built the track, of coarse. 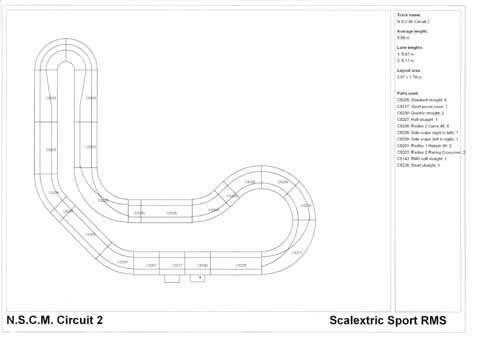 New Slot Car Modellers Circuit 1 I found this circuit to have evenly balanced lanes. It has 6 bends (changes of direction) including a hairpin corner which makes it very technical. Its layout is very compact so great for those of you with limited space. Click HERE for RMS download. Click HERE for large picture with track list. 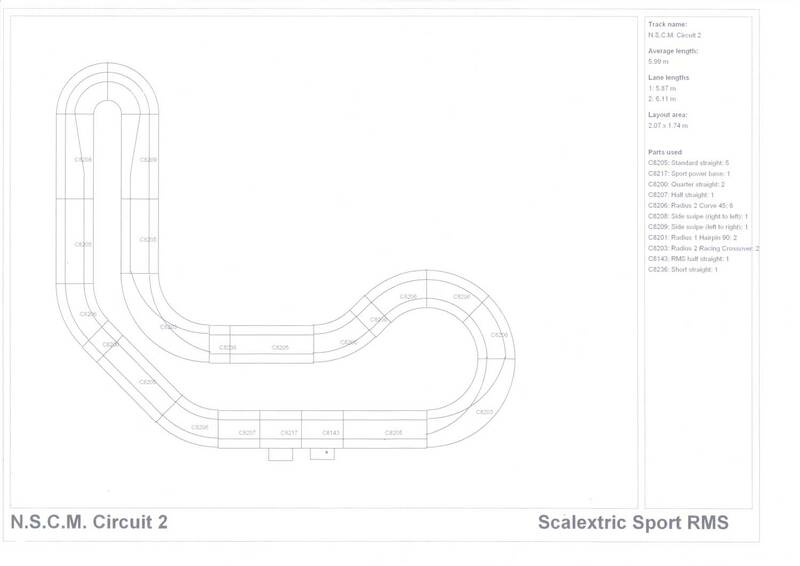 New Slot Car Modellers Circuit 2 This circuit is not evenly balanced without runoff sections. It has 6 bends (changes of direction) including a hairpin corner which makes it very technical. Its layout is very compact so great for those of you with limited space. New Slot Car Modellers Circuit 3 This circuit is not evenly balanced without runoff sections. It has 6 bends (changes of direction) including a hairpin corner which makes it very technical. It also has some straight sections that you can build up speed on. This layout is very compact so great for those of you with limited space. New Slot Car Modellers Circuit 4 This circuit has 6 bends (changes of direction) including a hairpin corner and is in the classic figure of 8 which makes it both technical and evenly balanced. It also has some straight sections that you can build up speed on. This layout is very compact so great for those of you with limited space. New Slot Car Modellers Circuit 5 This circuit has 6 bends (changes of direction) including a hairpin corner and is in the classic figure of 8 which makes it both technical and evenly balanced. It also has some straight sections that you can build up speed on. This layout is very compact so great for those of you with limited space.